The museum is a strange and astonishing place and absolutely worth a trip, just for the maze-like castle-like building alone. He would add rooms as he found new stuff, so sometimes you're walking along what was once the roof until he added a bunch of new rooms. 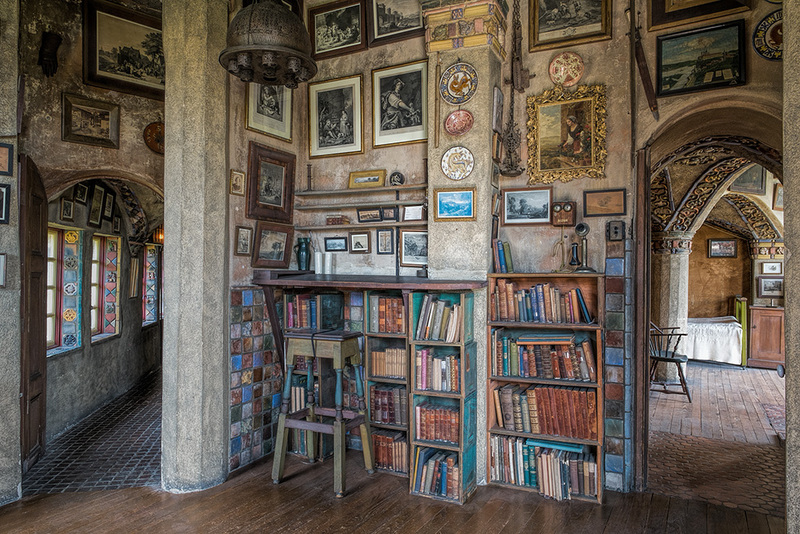 Mercer's house, "Fonthill," is also kind of astonishing. The furniture, for example, is made of concrete with upholstery; the dressers are concrete with wooden drawers. He liked to work by natural light so he had work spaces that tracked the sun as it moved across the sky. I grew up near there as well (Lansdale), my dad grew up in Doylestown, and we went there pretty often to visit my grandparents. 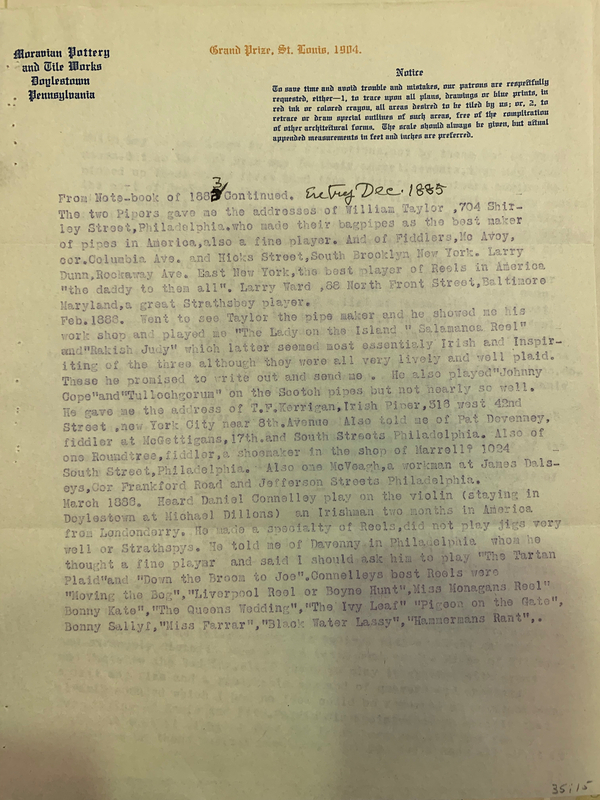 Mercer's letters are full of the greatest enthusiasm for "irish folk music." He really gushes about it. He talks about visiting the Taylor brothers in their shop--in several shops--and he tries to get their tools after they pass away, but they end up in the hands of a guy in delaware who "won't answer my letters," says Mercer. He clearly had a great deal of respect for the Taylors as craftsmen. Fascinating. Do you have access to these documents at the museum? Sounds like a treasure trove of information well worth trying to make more widely accessible. A lot of the Mercer correspondence was written up in I think the most recent issue of An Piobaire. It's not on their website yet. Peter Laban kindly sent me a copy. "about 1885, I heard John Eagan who was then considered the best Irish bagpipe player on this side of the water...I was astonished and immensely delighted not only at the amazing skill of the performer but at the perfectly delightful and then to me new and unique field of folk music which he introduced to me..."
"thoroughly exhilirating and remarkable reel called "the Boyne Hunt" which has been running through my head as a sort of refreshing and curative elixer ever since. The remarkable feature of this music seems to be...that while great songs of Ireland all express an exquisite sadness which brings tears, these tunes on the other hand are steeped with a tumultuous, unalloyed gayety [sic] and complete absence of sensualism or sorrow not to my mind found in similar Italian, Greek, Slavik, German, Scandinavian or Scottish dance music "
Mercer says he visited the shop often. I'm still transcribing some of the letters. Mercer's are typed, but O'Neill's are handwritten. A two part article by Caoimhin MacAoidh. Concluding part in the next issue. Looks like the bottom 4 holes have been plugged and re drilled, any one else notice ? That is the bottom 4 chanter holes ..
As mentioned, this set was profiled in An Piobaire, Vol 10, No. 5 (Dec. 2014), Page 24. The article doesn't give any historic details on the alterations to the chanter. But as also mentioned up-thread, the set was at one point owned by Robert Hutton, a maker of Scottish pipes (and a small number of Irish pipes) originally from Edinburgh. I wonder if Mr. Hutton was responsible for the plugging and re-drilling. More details of the purchase of the Taylor pipes as well as Taylor pipe-making tools by Mercer from Hutton are in An Piobaire, Vol. 12 No. 4 (Sept. 2016), Page 27. "You speak of the power of tunes to haunt the memory…. [Mercer recalls one he heard played by the English gardener at his Father’s house, Jesse Wilsher; Wilsher played a tune] which he repeated over and over again sitting alone on the back porch he seemed to fall into a sort of trance and he played it and played it until it filled the night air betwixt the Katydids and crept deep into my heart where it has remained ever since, getting into the blood and inspiring the heart to conquer fatigue and press onward…Wilsher said he lived a long time in Ireland where he had been employed at Lismore Castle and had learned the tune the name of which he did not know." Mercer sends him a transcription of the tune, done by another Mercer employee named Swain, and O'Neill replies "Jesse Wilsher’s melody or strain as scored by Mr. Swain seems to me to be a hymn tune–with little or any Irish characteristics"
Mercer was a real gentleman in his letters. O'Neill is by then 72 or so and getting on in years; he complains about failing eyesight and other maladies of age. He repeats himself in his letters. Mercer takes no notice of it. In 1922 O'Neill writes "My eyesight has failed so rapidly that I can no longer indulge in study or research only the partial sight of my right eye is all that remains of a one time keen vision." 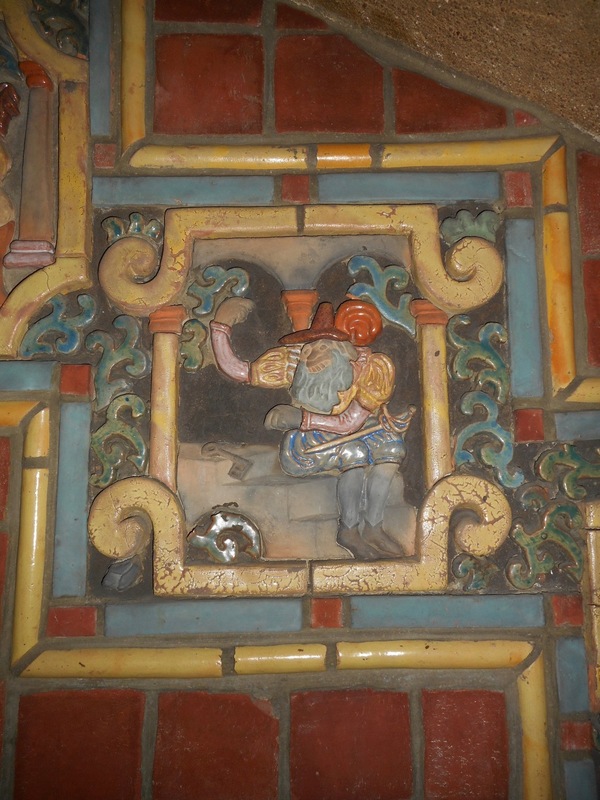 Mercer was part of the Arts and Crafts movement and he manufactured "Moravian" tile, which was a specific type of glaze with typically figurative decoration. You can find it all over the US on turn of the 19th century buildings--there are great examples in DC Philly, NY, San Francisco.